The Berlin Spectator - Germany in English. Put 500 female Soul singers into a big hall and make them sing in front of a blindfolded person. That person will find Chaka Khan immediately. Repeat the same experiment with 5,000 Soul singers. Again, the blindfolded individual will find her within seconds. This would even work with 5 million singers. Chaka Khan, who was born as Yvette Marie Stevens 66 years ago today in Chicago, is among the most powerful, the most convincing Soul vocalists ever. Nobody sounds like Chaka. Her voice just does not have limits. 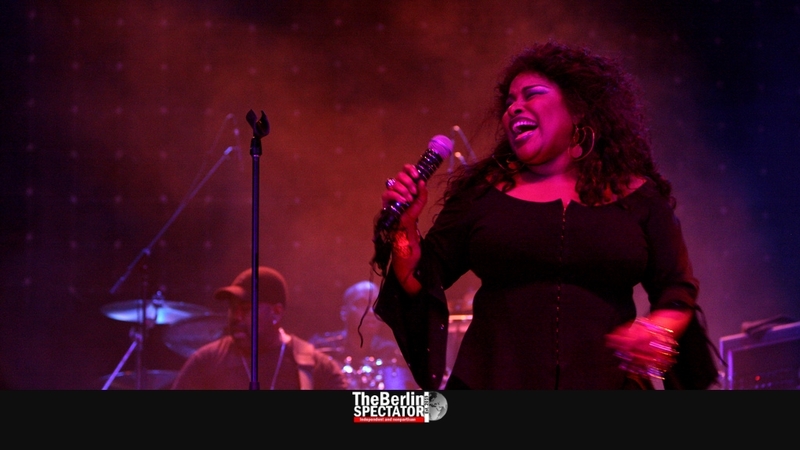 She has been on stage and in studios for well over 45 years, delivering it all, from Jazz to Funk and even Pop, but always in a very soulful way. The Chaka Khan way. She has sold 80 million records and was drowned in awards. It started when Yvette was still a child. Her grandmother introduced her to all that Jazz, which remained the genre she was always into, and still is. Her sister Yvonne, whose stage name was Taka Boom, became a successful musician too. So did her brother Mark. Asked about Chaka, Miles Davis once said this: “She sings like my horn.” Like in the case of that horn of his, not everything she has ever sung is easy to digest. But it is all brilliant, genuine and convincing. That is because it is all Chaka, meaning unique. After singing for several groups, Chaka Khan heard about a vacancy in a band called Rufus. Their singer had just left and she wanted to give it a try. Even though the first Rufus & Chaka Khan album was not successful at all, her decision to join this group was good, since that constellation would soon record some of the greatest Soul and Funk tunes of all time. “Tell Me Something Good”, composed by Stevie Wonder, became their first hit. Years later, “Ain’t Nobody” was their biggest one. In between, they recorded stunning albums, such as “Ask Rufus” (1977), “Street Player” (1978), “Masterjam” (1979) and “Camouflage” (1981). With Rufus, Chaka Khan’s majestic, breathtaking voice, personality and stage presence was supported by genius musicians, including guitarist Tony Maiden and drummer John Robinson. Decades after Rufus disbanded, Robinson, one of the busiest drummers on the planet, got to play with Chaka again, in a very different constellation. That was when star composer David Foster put everyone he had ever worked with on a large stage, a few years back. She sang his composition “Through the Fire”, which is featured on her 1983 album, with John Robinson on the drums. With a voice like that, nobody would just be “one of the members of Rufus” forever. Chaka Khan just needed a solo career. While still recording and touring with Rufus, she recorded her first solo album “Chaka” in 1978. It included the smash hit “I’m Every Woman” and a wonderful duet with George Benson, who turned 76 just yesterday, entitled “We Got the Love”. Her next album, “Naughty”, was brilliant too. So was her interpretation of the Soul classic “Move Me No Mountain”. She recorded some amazing stuff before 1984, including her album “What Cha Gonna Do For Me”. That one featured Dizzy Gillespie’s “A Night in Tunesia”. Chaka’s sung version is entitled “And the Melody Still Lingers On” and Dizzy himself was part of the recording. There was more to come, before things turned south, musically. The “Echoes of an Era” album with Chick Corea, Stanley Clarke, Freddie Hubbard and other Jazz masters was a product for those who really understood where Chaka Khan came from. Then, in 1983, her record “Chaka Khan” was released. Since this happened in the 1980s, she and her team tried to adapt. And they did so a little too much. Crossing Chaka’s voice with drum programming and 1980s synth sounds was not exactly the kind of approach Soul and Funk purists were looking for. On the other hand, that direction made her even more successful. In spite of the very commercial tendency, the “Chaka Khan” album contained masterful sounds. One tune, the “BeBop Medley” even got her a Grammy award, while the entire album got her another one. Her “BeBop Medley” is basically a journey through Jazz standards, including “Hot House” by Tadd Dameron, “East of Suez” by Lou Stein, “Epistrophy” by Thelonious Monk, “Yardbird Suite” by Charlie Parker, “Con Alma” by Dizzy Gillespie, and “Giant Steps” by John Coltrane. That medley, garnished with partially annoying 1980-s sound elements, gets stronger as it progresses. It ends with everything Chaka Khan stands for, her voice at full throttle. That tune should definitely be listened to in its entirety, in spite of that tendency mentioned. Whoever listens to all of it will understand what this singer, the vocalist of vocalists, can do. In 1984, the author of these lines, who is obviously a big Chaka Khan fan, could not believe his ears. He hated “I Feel for You” the first time he heard it, and still does. But that tune became one of her biggest hits, during a time when it wasn’t about quality anymore, but coolness, not about expensive arrangements, but visuals. On the other hand, Chaka Khan was still Chaka Khan. She always included some nice Soul ballads on her very commercial albums. Then, in 2004, “Classikhan”, a very interesting recording, hit what they call record stores nowadays. On that one, she sang Jazz classics, including two James Bond tunes sung by Shirley Bassey decades before: “Goldfinger” and “Diamonds are Forever”. And with “Funk This”, she tried to revive her Funk era in 2007. Here we are, Chaka is 66. In the past 46 years, she gave us hours and hours of killer songs. In return, she got a total of 10 well deserved Grammy awards. Over the past decades, she has lived in England and Germany for a number of years. Chaka Khan entered rehab in 2016, and a few times before, because of a painkiller addiction. Earlier, in the 1990s, she fought cocaine, heroin and alcohol addictions. Her Chaka Khan Foundation helps children with autism. In 2017, she told an American radio station that the story behind it was personal. Her own nephew’s struggle with a developmental disorder made her start the project. Another aspect which makes her très sympathique is the fact that she supported the Israel Defense Forces (IDF) at a big fundraiser in 2012. They collected 14 million Dollars. One thing is certain: The world will hear a lot more from Chaka Khan. And the memories she already has delivered will last, including her performance with a band called Zebra in Heidelberg, in the late 1980s, during which the guitarist tried to outperform her with solos. He did not succeed. Berlin and its Chronic Lack of Direct Flights to the U.S.
Germany Quiz: Are You German Enough? © 2019 - The Berlin Spectator. All Rights Reserved.